We just capped off 12 days of new features, but we couldn't resist adding one more before the holidays! As the year comes to a close and teams start looking ahead to 2017, an understanding of how you and your teammates are using data and reports can help you open up data to the rest of your company. Which dashboards do our teams rely on most? How many queries did we run last week? What times of day do people run the most reports? Today, we're getting meta and adding insights into how your team uses Mode. Mode users on the Plus Plan will now see a new Stats page under Settings. Get a high-level view of your organization's makeup. Do most reports live in Personal, Community, open, or limited Spaces? 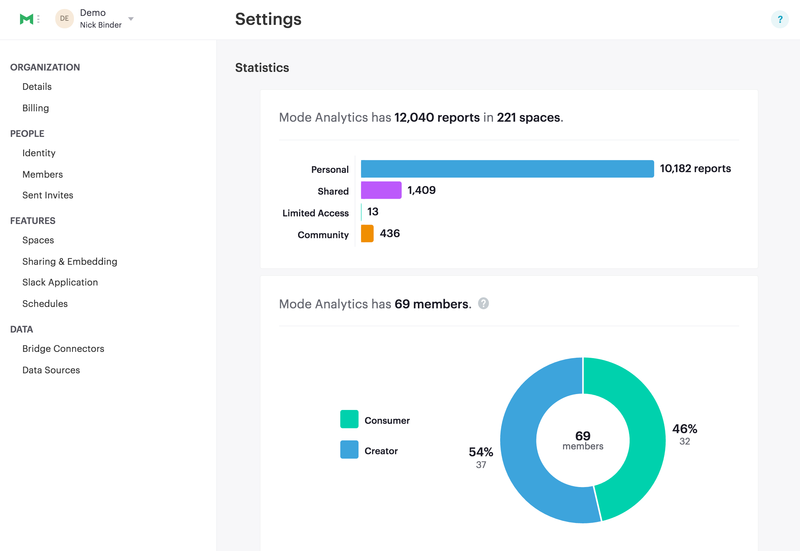 Do more people use Mode to create or consume reports? If the majority of reports are hidden in Personal Spaces, you might want to move work to new open Spaces organized by team or project. Identify mission-critical reports. Core KPIs. Vendor performance reports. Predictive marketing models. With a list of the most-run reports, it's easy to see which analyses power your business. Understand database load. What days and times see the most query runs? Pinpointing when queries are run can help you spread out scheduled runs and lighten the load on your database—especially during times when your analytics team is doing the heavy lifting of exploratory analysis. Make the most of Mode features. Emailing reports or sharing dashboards in Slack are key to ensuring your analyses make an impact. Definitions allow you to establish consistent business logic with a SELECT statement for reuse across multiple queries. We built this dashboard with custom styling in Mode's HTML editor and seamlessly integrated it with our product using Mode's new White-Label Embeds. Learn how you can deliver analytics to your customers in record time. The new Stats page is just one of many features for customers of Mode's Plus Plan. From granular user-based permissions to tools for establishing rock-solid business logic, the Plus Plan offers features designed to support companies that want to open data to everyone. Contact our team to learn more.